A strong geomagnetic storm caused by solar wind set off adazzling aurora display this week that treated skywatchers in North America tostunning red northern lights. ?And it could happen again Saturday. 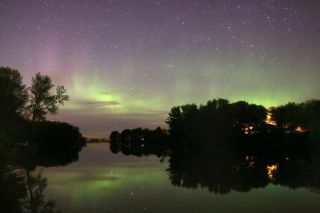 The auroralight show occurred overnight May 2 when a stream of high-energyparticles from the sun, the solar wind, hit the Earth's magnetic field to kickoff a strong 15-hour geomagnetic storm, according to the website Spaceweather.com,which monitors space weather. During Sunday's event, the solar wind interacted withEarth's magnetic field to create a huge aurora display that stretched tounusually low latitudes, making it visible below the Canadian border to someskywatchers in the northern United States. The red auroras during thedisplay, in particular, stood out. "The red auroras were just visible to the naked eyeand easily captured by my Nikon D300," skywatcher Joseph Shaw of Bozeman,Montana, told Spaceweather.com. "Excellent treat!" The auroras also dazzled Tony Wilder, of Chippewa Falls,Wisc., who photographed green auroras reflecting off a nearby body ofwater. "It's been 5 years since I last saw the Northern Lightsin my neck of the woods," Wilder wrote in a comment posted toSpaceweather.com. "And what a show it was!" Wilder also said he spottedthe International Space Station fly across his night skyview three separate times. The space station is home to six astronauts and as largeas a football field. It is the largest man-made structure in space and caneasily be seen from Earth by the unaided human eye.